The world today has been inundated with articles in magazines, celebrity news etc around the topic of plastic and cosmetic surgery. However many are not aware of the differences between the two as these the terms are often used loosely within the media and discussed by the general public, without true understanding. Plastic surgery and cosmetic surgery are most easily distinguished by their on their core objectives. After all, these disciplines encapsulate many of the same actual procedures. But it’s how these procedures are applied, along with the goal(s) as mentioned above, that separates them. Whilst Cosmetic Surgery has become increasingly focussed on enhancing physical appearances, on an aesthetic/cosmetic level, Plastic Surgery has always been about repairing defects/damage to reconstruct normal physical/functional appearances. However, quite a few plastic surgeons focus on cosmetic surgery as well and hence it’s easy to get them confused. It’s important to keep in mind that the overarching philosophies that outline the research and training, whilst guiding the goals for patient outcomes, are vastly different between the two. Plastic Surgery is an altruistically motivated practice and is based on the reconstruction of body/facial defects that are congenital, or due to accidents, war and trauma and sometimes even diseases. The practice is dedicated to correcting dysfunctional areas that assist the individual in living normal/semi-normal lives. The basis of training to become a plastic surgeon is rooted in reconstructive surgery even though plastic surgeons choose to branch out to the cosmetic surgery practices. Plastic surgery practice is considered as more of a rewarding experience based specialty that visibly – and sometimes dramatically – changes the lives of children and adults, enhancing their ability to live and enjoy life. Cosmetic Surgery, on the other hand, is dedicated to trying to achieve a near perfect human/facial form or change aspects of one’s appearance that you may not be happy with. The practice is dedicated to improving physical/facial symmetry, aesthetic appeal, and proportions. The surgery can be performed on all areas of the head, neck, and body and is an elective form of surgery as the treated areas are generally functioning normally. Of course, it goes without saying that these procedures can also enhance confidence and many will attest to the fact that they often make a big difference in people’s lives. 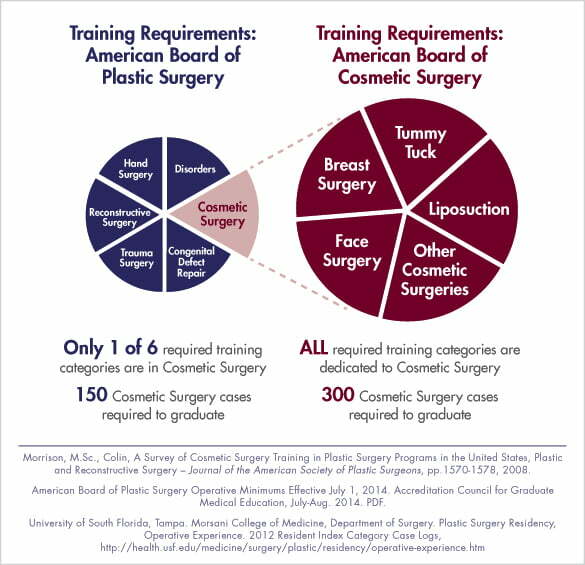 Below is an infographic is taken from https://www.americanboardcosmeticsurgery.org/patient-resources/cosmetic-surgery-vs-plastic-surgery/highlighting the training requirements for both practices in the USA. In the UK, one has to complete their surgical training after graduating with a degree in medicine to obtain the MRCS (Member of the Royal College of Surgeons) qualification and then move onto higher surgical training. Cosmetic Surgeons can then go and branch out into the area or field of surgery that they want to train for. Any licensed physician holding a GP (General Practitioner) is qualified to conduct cosmetic surgery irrespective of how they received their cosmetic surgery training. Plastic surgeons once fully trained and qualified can use these after their name depending on where they qualified: FRCS – Fellow of the Royal College of Surgeons of England, FRCS(Ed) – Fellow of the Royal College of Surgeons of Edinburgh, FRCS (Glas) – Fellow of the Royal College of Surgeons of Glasgow and FRCSI – Fellow of the Royal College of Surgeons in Ireland. All surgeons are required to constantly undergo CPD under the aegis of RCS (Royal College of Surgeons) and there are constant appraisals that help validate the credibility of the surgeon in practice. Patients are advised to ask questions about a surgeon’s specific Cosmetic Surgery training and his/her experience before going ahead with a Cosmetic Surgery procedure. However, when qualified both plastic surgeons and cosmetic surgeons will generally work for the NHS and for private practices. With origins as far back as Ancient Egypt, Plastic Surgery has evolved to one of the most advancing specialties in medicine. Advancements in microsurgery and tissue engineering are extremely significant in saving lives today. Techniques such as the Micro-vascular free tissue transfer along with microsurgery has made it possible to replant severed body parts ranging from whole limbs to fingertips and move tissues to reconstruct defects. Pioneering surgery involving neuro-electric stimulation of limb muscles in tetraplegic patients to restore hand function and a range of technological and tissue engineering advances that have led to improvements in the management of nerve injury, skin cancers, and wounds are all already showing us a glimpse into the future of plastic surgery. Today it is an integral part of most hospital practices globally and this field is now attracting more women than ever before. In fact, UK has seen a rise of almost 25% of women plastic surgery trainees. Medical science is on a fast track and so far 2017 has seen cosmetic surgery becoming safer and less invasive with more effective procedures to choose from. With the huge rise in non-surgical injectables such as Botox , sophisticated but simpler Hair Transplant techniques like BioFibre Hair implants, and Laser Skin resurfacing techniques, cosmetic surgery trends, in the coming years, looks set to be far more affordable than ever before. Advances in technology and digital media have also been a major factor in the rise and demand of both plastic and cosmetic surgeries along with more awareness. As research plows ahead at record speed, it will be exciting to see what comes next for plastic and cosmetic surgery. Note: Every patient is unique. No two surgical procedures or treatments will produce identical results, even if performed by the same surgeon. Be sure to discuss your options with a board certified surgeon. Finally, the decision to undergo any surgery must be well thought-out, following a thorough consultation with the right doctor (do your research- look at before afters, testimonials etc to understand the credibility of a surgeon), and realistic expectations. The procedures he routinely performs can be found on and an appointment with him can be booked for free. If you would like to schedule a consultation with Dr Ashish Dutta please book your free consultation or call us on 0191 5672900.